BPSC 64th Combined Prelims Exam 2018. Available Posts are Police Sub Inspector, Supply Inspector, Block SC ST Welfare Officer, Block Minority Welfare Officer, Labor Enforcement Officer, Division Officer, Block Panchayat Raj Officer, Rural Development Officer, Assistant Director Cooperative Societies, Commercial Tax Officer, Bihar Police Service, Probationary Officer, Sub Inspector, Jailor, Planning Officer, Assistant Director Social Security, and District Audit Officer. 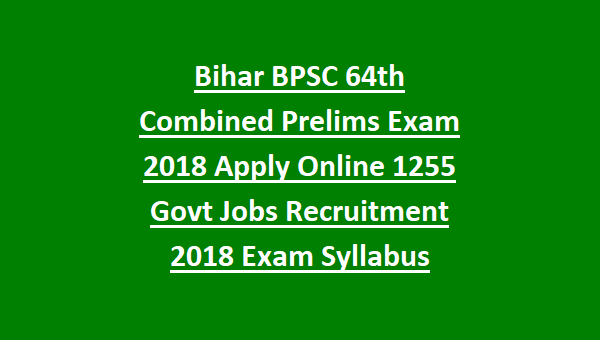 Only Graduation/Degree completed candidates are eligible for this Bihar BPSC 64th Combined Prelims Exam Notification 2018. Candidates must have register their application form online from 03-08-2018 to 31-08-2018. Official website to apply online for these BPSC 64th Combined Prelims Exam 2018 www.bpsc.bih.nic.in. BPSC 64th Combined Competitive Prelims Exam Pattern, Exam Syllabus, application fee, post wise vacancies and other details are given below. 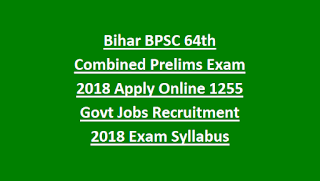 There are total 1255 posts are going to recruit through this BPSC 64th CCE Exam 2018. For Sub Inspector posts age limits are 20-37 years. For Probationary Officer, Rural Development Officer, Labor Enforcement Officer, Supply Inspector and Block SC ST Welfare Officer Posts age limits are 21-37 years. For all other posts are limits are 22-37 years. For Female General, BC, MBC candidates upper age limit is 40 years. For SC/ST candidates upper age limit is 42 years. For Ex Serviceman age limits are applicable as per Service Norms. Pay Scale is applicable from Level 6 to Level 9 for all the posts. For the post of Excise Inspector, Sub Inspector of Police must have required physical standards. Candidates selection for these vacancies will be on basis of 64th CCE Prelims exam and Mains Exam followed by Interview. BPSC 64th Prelims Exam will be conducted for150 marks. All the questions are objective type. 40% for general, 36.5% for BC, 34% for OBC, For SC/ST, Female and PH candidates minimum qualification marks is 32%. Online mode of applications only accepted for this 64th Combined CCE Prelims Exam from 03-08-2018 to 31-08-2018. Fee payment last date is 24-08-2018. Official website to apply online is www.bpsc.bih.nic.in.